You could define a good day when everything goes your way, when nothing can take you out of your motorcycle riding rhythm. No work and stress or minor irritations are brushed aside because of the euphoric emotions flowing with the wind in your face. That was the vibe heading into the 2010 Good Vibrations in Salem/Keizer this past weekend. It had the perfect concoction for a motorcycle rally – deep blue clear skies, mid-70 degree weather, and a solid line up of vendor booths along with some good music mixes. Arguably the chamber-of-commerce would view it as a successful inaugural motorcycle rally – independent of key indicators – as the city rolled out the red-carpet with the goal of helping the mid-valley economy with tourism dollars. Our group did a 4-hour drive-by on Saturday as we rolled down and explored the asphalt ribbons of Hwy 219 through the farming valley. The dust has now settled and the rumble of bikes is all but a memory of the rally so it’s time for some feedback. 1. Marketing: Do more advertising, and do it earlier. Leverage low-cost word of mouth motorcycle clubs disti lists, social media etc., to get the word out. Even with a blog post, and all the talk about an Oregon motorcycle rally with friends, relatives and business associates the attendance wasn’t contagious. We arrived at the registration hotel (Keizer Renaissance Inn) along with about 4 other motorcycles to have the receptionist tell us that the event was “SPREAD OUT” all across town and we were not at the ‘hub’ of the event. 2. Maps: Provide one! Provide an event map on the web site. Provide an event map on the pocket flyer. Make .PDF maps available for e-distribution. Train the hotel employees on how to answer ‘visitors’ question about what is going on. Admittedly I’m unfamiliar with the inner Salem/Keizer streets and finding some parts of the rally venue was like an exercise in trying to escape the legislature tax hikes. It was near impossible. We looped the bridges on Hwy 22/99E/221 so many times it felt like movie Ground Hog day! 3. Balanced Police Presence: local police were everywhere (biking, walking, Segways) and the ever visible patrol cars on side roads made the event lose some of the ‘festival’ vibe. If they would have been enforcing the anti-littering laws against all smokers throwing their butts everywhere they’d rake in thousands vs. needing comprehensive street patrols and zero-based-tolerance of straight pipes modified exhausts. 4. Wine Tour: Do more to dispel the negative perception that motorcyclists are wildly racing through farm country on winery tours – “just sipping”, of course – to the next watering hole. I received a number of emails and comments that it’s no wonder people don’t take motorcyclists serious if they don’t operate sober and safe. Need to change the overall messaging. The impact of tourism in Oregon is powerful. According to Travel Salem, in Marion and Polk counties tourism employs more than 5,600 people having an estimated economic impact in 2009 of $452M. While I don’t agree with how everything was implemented at this year’s rally I do want to provide a major shout out to Randy Burke and Road Shows Inc., team for all their hard work in bringing what hopefully is an annual motorcycle event to the state. 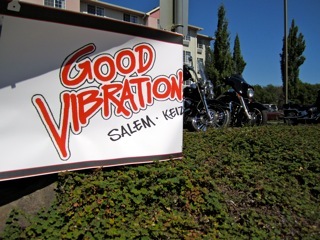 According to news outlets, the animal rights activists group who earlier this year declared “War on Leather” will not be attending the first annual Good Vibrations Motorcycle Rally in Salem/Keizer. That’s a good thing because the motorcycle rally which happens this coming weekend (July 16 – 18th) in the Salem/Keizer area is expecting hundreds of motorcyclists… some of which will be wearing leather in the form of… shoes, chaps, jackets, coats, gloves, hats and belts! I blogged previously about this rally back in February HERE. 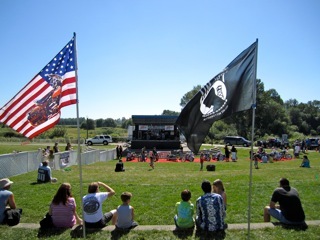 The rally activities are happening at Salem Harley-Davidson, Oregon State Fairgrounds, Spirit Mountain Casino, and the cities of Dallas, Monmouth, Independence, and McMinnville. 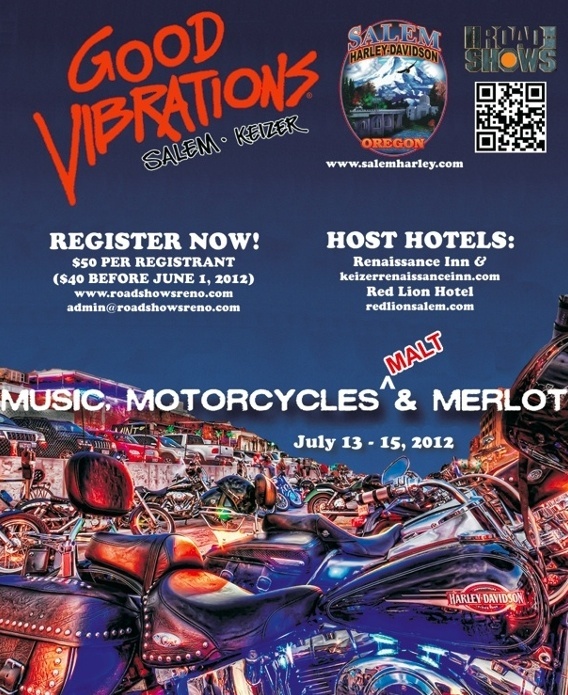 The Good Vibration event is produced by Randy Burke, President of Road Shows Inc., and is modeled after his most popular Street Vibrations Rally held in Reno, NV. The Oregon rally has the added value of wine tastings at Willamette Valley Vineyards and Orchard Heights Winery along with the fantastic Northwest scenery and winding roads. Hopefully you get the opportunity to participate in the first annual rally. 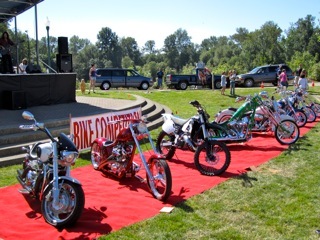 A portion of the proceeds benefits the Christian Motorcycle Association and the Juvenile Diabetes Association. Registered participants will receive an official event t-shirt, hog tags and ride pin. They will also be able to participate in poker runs, get free admission to VIP parties, two ride-in shows, a parade, and live entertainment. Check out the schedule of events here!